Campaign #2 has ended. Thank you all who doubled their donation to raise $1,000 to Enhance Child Literacy with new books each month for 30 CHILDREN FOR A FULL YEAR! $1,000.00 Donated of $1,000.00 goal including Match. $0.00 Matching Funds Remaining. BEGIN WITH BOOKS is Charleston County’s premier early literacy program, and we are proud to have been working with Charleston Housing Authority since we opened service on Charleston Peninsula in January 2013. BWB distributes FREE monthly books by mail to babies and toddlers from birth through age 4, in order to encourage caregivers to read more often with their youngest children and grandchildren, and to enable pre-school family literacy activities in the home. 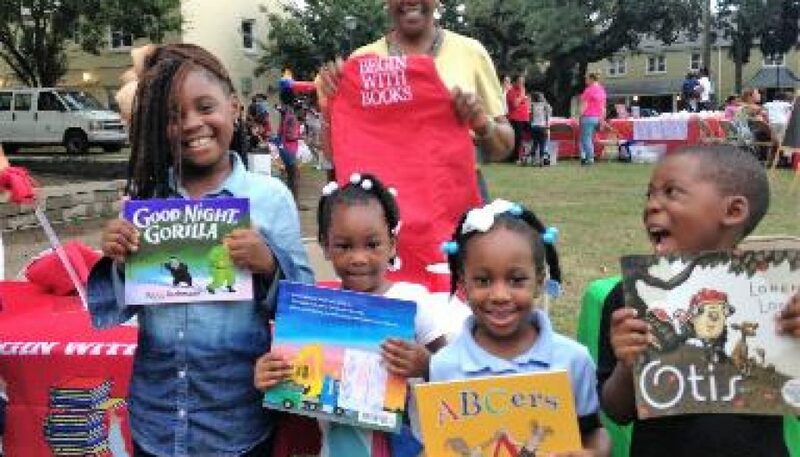 The organization participates annually in Community Resources Day, the Spoleto Jazz event at Robert Mills Manor, the MOJA block party, and has partnered on other initiatives to make books-by-mail programs available to the residents of Charleston County. BEGIN WITH BOOKS has enrollment displays and materials in many offices and community centers. BEGIN WITH BOOKS makes a difference for thousands of babies and families in the lowcountry every month! Exciting to think that my gift will be matched so that THREE pre-school kids will get books for a year. That's a lot of stories! Hope this helps with the matching gift challenge!! I love working with Begin With Books!